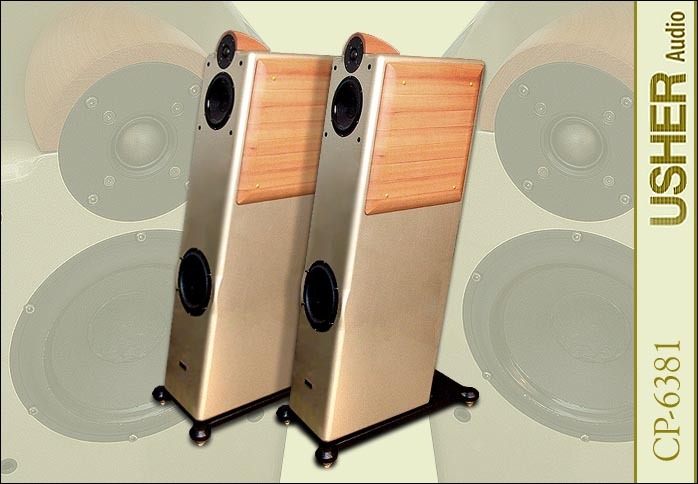 Judging from their published photos, the Usher CP-6381 loudspeakers certainly looked to be well finished. A close look at the drivers made by Usher suggested that they were - well, based upon some very notable examples of the better drivers manufactured by some of the best driver manufacturers in the world. And let's be frank and not try to pretend that some of the speakers in the Usher line don't bear such an uncanny likeness to some of the better-known speakers in the world as to spell copycat - or at least strongly hint at it. I've got a fake Rolex upstairs that supports the theory that just because a speaker looks like a duck doesn't mean it's going to quack like one. These are certainly pretty speakers that will (at least initially) appeal to those who aspire to the speakers that inspired them. But surely the Ushers wouldn't have the temerity to compete on the basis of sound, right? That's what I wanted to find out. The Usher CP-6381 is much larger than its photos suggest. It stands 50 inches tall, 16 inches deep and 13 inches wide. Ostensibly to time-align the drivers, the speaker cants rearward, making the speaker's effective depth closer to 22 inches. Additionally, the CP-6381 comes equipped with bolt-on iron bases that are about 25 inches deep and 14 inches wide. Each speaker weighs 143 lbs including the 30-lbs base. Given the 8-inch woofer, I anticipated a speaker two-thirds the actual size of the CP-6381 which was much closer to my old Silverline Sonata IIs sporting dual 10-inch woofers. As if this kind of mass weren't enough, the CP-6381 features a compartment at the speaker's bottom (accessed via a little trap door at the rear) that's designed to be filled with sand, one feature I didn't make use of. The CP-6381 really is exceptionally well finished. The review pair came in a silver-metallic automotive-type finish though glossy white and black are available as well. To my roaming eyes, the finish was absolutely flawless and commensurate with products thrice the CP-6381's price - no kidding. 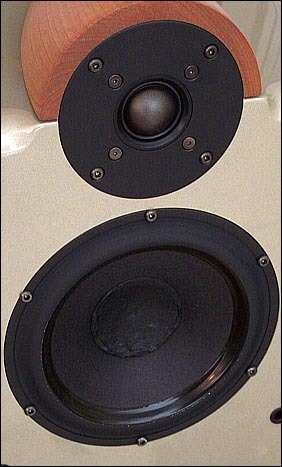 The wooden cheeks were sanded smooth and covered by a light satin finish that complemented the high-gloss lacquer nicely though I would have preferred that the wood extend down to the speaker's base. Interestingly and like some metallic finishes, the hue of the CP-6381 varied with lighting conditions though it usually had a golden tint that fluctuated in intensity yet was always highly attractive. 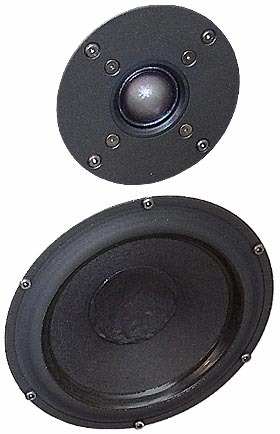 The CP-6381 is a 3-way system using a 1-inch silk dome tweeter, a 7-inch mid-bass driver and an 8-inch woofer. Both woofers are of the doped paper variety. Around back are two pairs of WBT-cloned shrouded binding posts for biwiring (unlike real WBTs, you can unscrew these until the nut comes off in your hand). Usher claims 87dB sensitivity, a nominal impedance of 8 ohms and a frequency response of 29- 28kHz (-3 dB). Other than crossover frequencies of 323Hz and 2.6kHz, they don't spell out any further information on the network but they do specify a power handling of 160 watts. have two midranges talking at you, they'd better be speaking in precisely the same voice or the result isn't going to sound natural. Such matching of drivers is expensive enough. Now keep in mind that this is stereo. You have two speakers working and thus will need 4 precisely matched midranges. That's tough. Well, it's not as tough as it is simply expensive to do right. And God forbid something should happen to one of the drivers in your speakers. For that reason, D'Appolito has avoided the D'Appolito configuration in his own Usher designs. In my small listening room, not only did the CP-6381s tower above me but I found myself looking up at their tweeter floating about 47 inches off the floor and about 10 to 14 inches above the tweeters of the last few pairs of monitors which these floorstanders displaced in my room. The speakers were placed such that those tweeters were spaced 89 inches from each other, 102 inches from my ears and 31 inches from the rear wall. Sidewalls were 43 and 51 inches away. The CP-6381s also spent a lot of time in my 15' x 23' family room as part of my multi-channel system. In neither room were the CP-6381s what I would call difficult to place but in my larger room, they were downright amicable. Where bass balance is concerned, the CP-6381s filled my smaller stereo room with all the bass it could handle but really appreciated spreading their wings in the larger room. There they sounded absolutely superb, among the best to ever grace that room. Honestly. While they didn't plumb the lowest half-octave of bass, they were very solid down to around 30Hz, usually plenty of depth. On both movie and concert DVDs, the bass was nicely balanced, very articulate and completely satisfying. Dispersion characteristics were such that the Ushers were easy to listen to from a wide array of seated positions. Even in stereo, concert videos were easy to enjoy. I also couldn't help but notice that while not perfect, they were a solid-enough match for my Magnepan CC2 center channel. For the most part I remained oblivious to mixing and matching up-front. Because the Magnepan is perhaps the most transparent and uncolored center channel I've ever used, that's high praise for the transparency of the Ushers indeed. differences. From Fender Strats to Gibson ES 335s to the 13-string pedal steel, the Ushers delivered all the various string tones with aplomb and the general music with a natural smoothness that simply flowed. Some of my favorite aspects of the DVD are all its featured drummers. Their names may vary but they are, for the most part, energetic and powerful. The Ushers were fully up to the task of delivering that rhythmic power to my room. Overall, it's a very well recorded DVD and whether I was in surround or stereo mode, it always sounded fantastic. Fancy your music loud? The Ushers can be pushed hard. Real hard. Loud music not for you? No sweat, the Ushers can play at late-night volumes and you won't feel as though missing a note or beat. Of course, if they deliver both the power and grace of music (and they do), they will be more than up to the task of delivering movie soundtracks. Overall, the CP-6381s are one of the highest performing yet most affordable box speakers I've ever used in that system. Without a doubt, if I were assembling that system again today, the Ushers would be very high on my list of contenders. What were the design goals for the 6381 and how does one series of Usher speakers differ from the next (to hear these overachievers is to wonder what you'll get when you spend more). The design brief for the Usher 6000 series was "a true high-end floorstanding speaker line that is compact and eminently affordable". In other words, no cutting corners whatsoever in all the performance-related aspects and with a cabinet design that is at the same time attractive, easy to live with and efficient to manufacture which is made possible only through the tremendous R&D efforts invested. Technically speaking, a flat on-axis response and broad uniform horizontal polar response were the two primary design goals. These goals do differ a little from one series to another. The Dancer series, for example, is cost-no-object though still an incredible value and therefore free to utilize the ultra-expensive beryllium drivers. Who is Usher's targeted market? I'm curious as to how Usher caters to -- or anticipates -- the tastes of listeners around the world. Do tastes still very from one geographical region to another? Where most manufacturers would seem to cater to their home audience first, I would imagine that Usher was intended from the start for worldwide distribution and I'm wondering how that affects the whole process if at all. At Usher, we don't anticipate different tastes of the reproduced sound in different parts of the world. At this level of performance, it's just not an issue. We do see differences in taste for the cabinet design, however. That's one of the reasons why we have more models than most other high-end speaker manufacturers. Back in my smaller two-channel room, the Ushers were just about 5½ pounds of flour in a 5-pound sack. They loaded the room with all the bass it could properly handle. That's not to say the results didn't sound good or weren't fun. But I was constantly aware that the CP-6381s were giving me just a tad too much bass. However, this bass never became slow, bloated or overbearing. On the contrary, it sounded good. Strictly accurate and neutral? Probably not. If that's what you seek and you have a similarly sized room to mine, check out the next model down in the Usher line. As potent as the bass was, it remained sharply focused, highly detailed, suitably fast and visceral. And since it didn't intrude on the clarity of the midrange, it was easily characterized as harmless fun. What didn't change in this smaller room was that the Ushers retained a potent rich fullness that I wish my reference speakers had through the upper bass. and distinct, were well served by the Ushers as were the cymbals on "Loisaida". What's more, the Ushers produced all the energy of the featured brass instruments without becoming edgy. Chimes and bells all had excellent presence as well.